The Scepter Packs in front of their namesake climb. 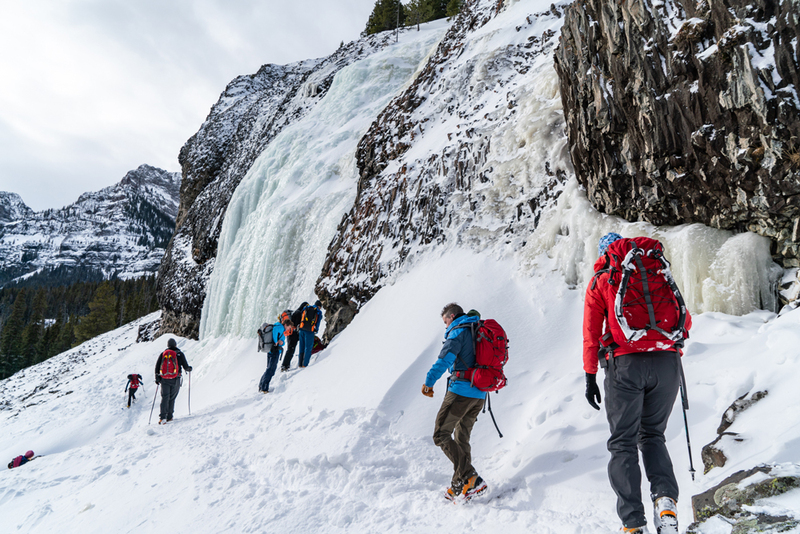 Last month, I was invited out to Bozeman, Montana by Mystery Ranch to do a little ice climbing and test out their new Scepter pack. Built with alpine/ice climbers in mind and named after a famous ice route in Hyalite Canyon, the pack could see no better testing ground. 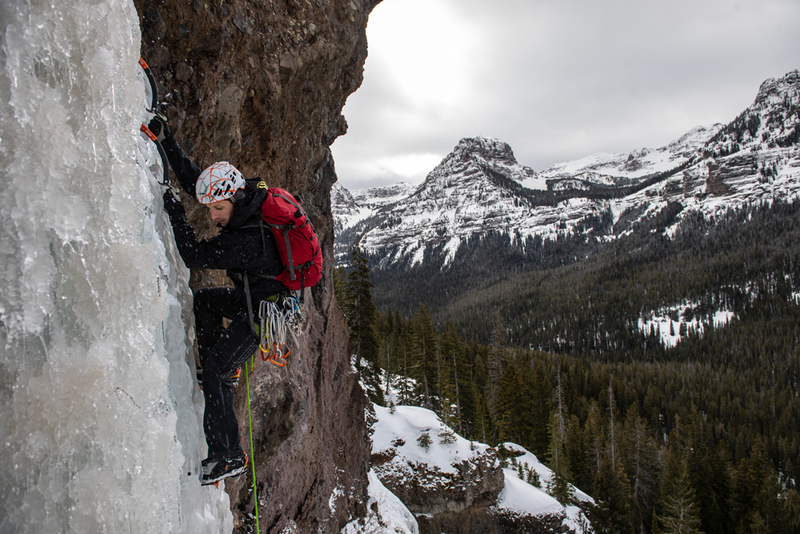 We spent two days climbing with the Scepter pack in Hyalite — one of my favorite climbing venues in the US as there is nothing but “wild ice” and so much of it. Mystery Ranch pulled together the Montana Alpine Guides crew along with some badass sponsored atheltes like Whit Magro, Becky Switzer, and Kyle Vassilopoulos to come help us have fun getting scrunchy, as local climber Conrad Anker likes to say. Cruising laps on Mummy II. Temps hovered in the 20s and 30s, not the below zero mornings I’m used to in Hyalite, making for hero ice conditions and keeping the screaming barfies at bay. The first day we hiked up to the Mummy area so we could have a chance to climb the WI4+ route the pack was named after. The Scepter is made from a burly 330 denier Robic fabric — a high tenacity nylon that is 50% stronger with 2.5x the tear strength of regular nylon. A daisy chain runs the length of the front of the pack with adjustable and even removable ice tool attachments. While I’m still an advocate for a substantial sleeve to tuck the picks behind, the beefier daisy chain serves to keep sharp tips in place and away from tear-prone puffy coats. The yoke (where the two shoulder straps come together behind you on the pack) telescopes for a custom fit and can be adjusted using the integrated plate that helps break the Velcro bond between the yoke and the backpack. I found the pack super comfortable to carry with no problem of load shifting while hiking up and over steep terrain. Inside the 35 liter pack, I had no problems fitting my crampons, harness, miscellaneous hardware, helmet, snacks, thermos, and plenty of extra layers and gloves for the day. My Petzl Nomics fastened easily to the outside of the pack, secured via the Velcro shaft holders and tool head locks. Kyle leads up the Scepter wearing his Scepter pack. In place of a lid, the Scpeter uses a unique fold over flap system that makes it easier to accommodate a rope or helmet beneath. The flap flips open towards the front of the pack to reveal two compartments inside that can be used to separate wet and dry gear if necessary. A small zippered pocket keeps your car keys and wallets safe from getting lost. 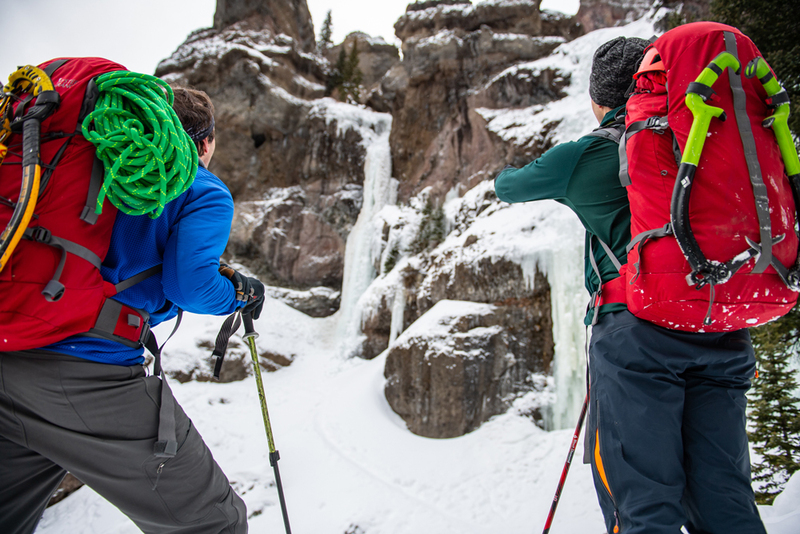 A removable bungee network at the front of the pack comes in handy for carrying crampons outside your pack or for quickly shedding a layer on approaches. The hip belt and side compression straps are also removable if you are looking for a fast and light ascent. Nervous, as it had been over a year since I swung some tools, I quickly found my swing-kick-kick groove and never looked back. I remembered why I love ice climbing so much. Part of The Unnamed Wall area of Hyalite. The second day we started early and headed up to The Unnamed Wall area where we would play on a bunch of different routes throughout the day. Perhaps my favorite and one of the most picturesque was the Elevator Shaft. I was close to giving the cool looking mixed route The Thrill is Gone a go but we ran out of time for the day. Next time Hyalite, as I know I will be back soon. The Mystery Ranch Scepter pack comes in both a 35L ($199) and 50L ($225) size and is available in two different colors (red and gray). 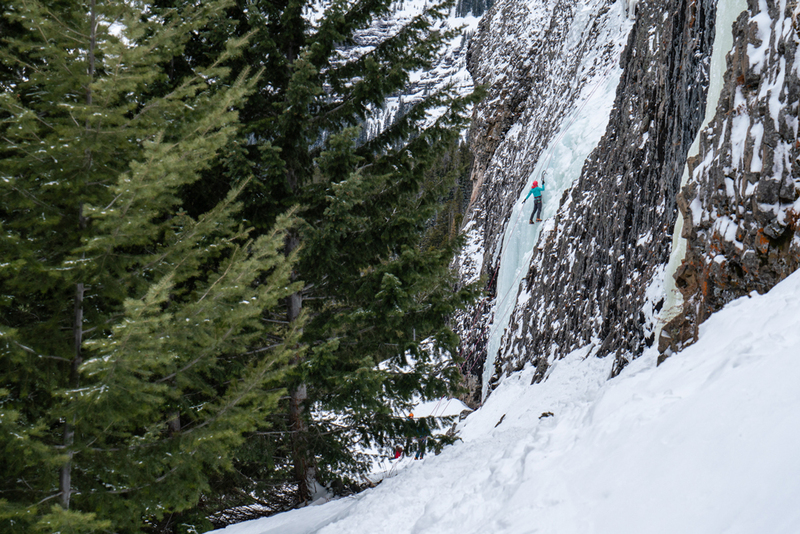 Expect the ice climbing packs to start shipping early in the fall.